What starts out as a seemingly familiar story – comic culture-clash-adventure as a city boy is forced to spend his Summer holidays with his granny in a tiny Scottish village – turns into something much more surprising and original, and not just because in his first week there the boy discovers the world’s last living Dodo. Danny dreads his holidays with Granny Flora: there’s nothing to do in the village of Kinoussie and the only other child within miles is bookish Susie, whose idea of a good time is watching TV documentaries on the life cycle of the tapeworm. But, inspired by his comic book hero, he is determined to find adventure somewhere, and where better than the small island in the bay, close to the centuries-old wreck of a Dutch sailing ship? The treasure that Danny discovers on the island is very precious indeed, but not what you’d expect: it’s feathered, loud, and very strong-willed. Looking after the Dodo, because eventually even Susie agrees that’s what Danny has discovered, is certainly fun at first, but catering to the needs of a living animal is much more demanding than anything in the Zac Hanaway, Space Runaway adventures he so loves; the Dodo isn’t a pet, and it certainly isn’t a sidekick, even though it seems to understand everything Danny says, and what’s more, it really wants to go home. 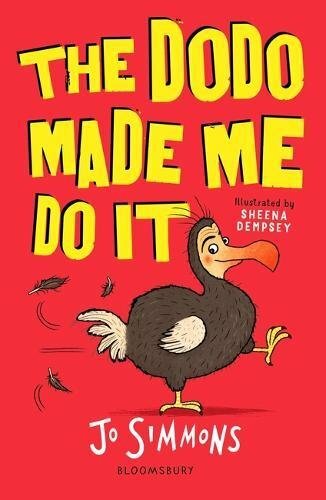 Danny has to admit that Susie is right, not only is he responsible for the Dodo’s happiness, but the information he needs might just be found in books. The plot bounces along from incident to incident, and there’s lots to have children laughing aloud. It should set them thinking too, about adventures – bigger and scarier in real life than Danny expected, but well worth going after even so. Lively and entertaining from beginning to end, and Sheena Dempsey’s illustrations are a treat too.